Following the recent market crash, investors lost $5.2 trillion worldwide before the market managed to recover most of the losses. There are hints that certain bubbles are ready to burst as the worlds biggest hedge fund positions accordingly. In addition to the stock market, the global gold supply is weakening, leaving investors anticipating higher prices. In 2017, the gold supply plummeted the most since any year since 2008. 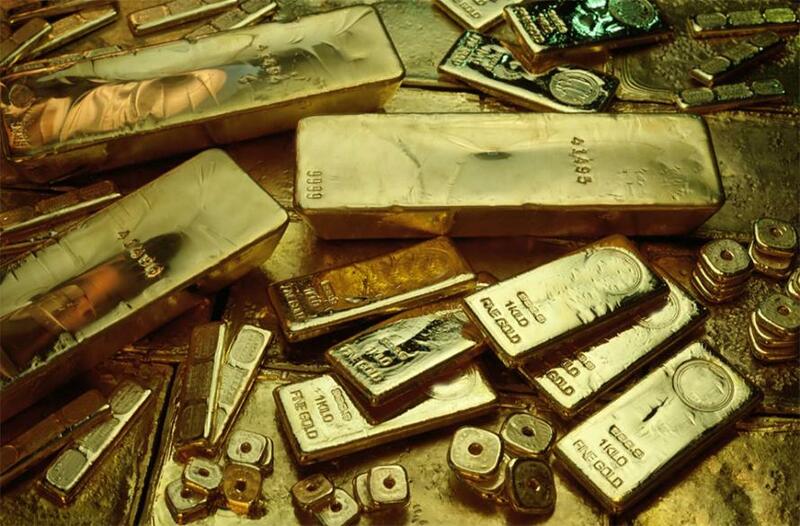 If the supply of gold is really plateauing, experts are predicting a 'peak gold' period. China, the world larger miner of gold, produced 453 tons of the metal in 2016. In 2017, China’s production fell by 9 percent. If production of gold continues to fall, a rise in global demand is a certainty. The demand will come from investors and centrals banks unwilling to rely on the dubious strength of the US dollar. The Chinese are enjoying a boon economy, and the newly rich who can afford it are looking to buy physical gold in an effort to protect their wealth. China supplies its gold only domestically and does not export the metal. If China’s domestic gold supply is depleting, it will certain seek to buy gold elsewhere. Part of Chinese economic plan is to potentially reduce the global dominance of the dollar with the yuan. The US dollar has dominated the global currency market for over 40 years. China, and Russia are actively increasing their gold reserves, which could lead to both economic and political uncertainties as more countries begin to dump US Treasuries. Both Russia and China are planning to use gold-backed currency as payment when trading with each other. This makes gold a critical commodity for both countries. China might import gold to meet its own demand. But the available supply of gold is finite. During the past 15 years, global gold deposits have become depleted, and replacement deposits are becoming rarer each year. World Gold Council Chairman Randall Oliphant has indicated that global gold production may have reach its peak. The time may come soon when the supply is not expected to meet the demand. The price of gold usually rises during times of economic slowdowns. How will the global financial market react when the supply of gold is running low and gold becomes an even rarer commodity? China is not the only country producing less gold. South African and Australian gold deposits are showing signs of becoming depleted. The cost of exploring for new gold has become cost prohibitive and viable deposits are becoming more difficult to reach. The potential of a worldwide shortage is good news for investors. 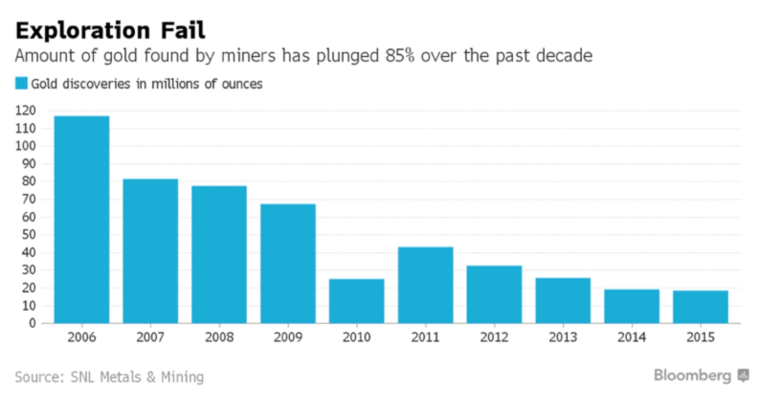 Even as mines become exhausted, gold as a commodity will still exist. Gold differs from oil, which, once used up, is physically gone. But gold mining and exploration will become more costly. For over 130 years, massive gold deposits were discovered in a number of countries. Gold has been easy to access and produce. During the late 20th century, some mines were producing as much as 50 million ounces of year a year. In the 21st century, mines producing 50 million or even 30 million ounces of gold no longer exist. Gold exploration is down to a few discoveries producing 15 million ounces annually. The price of gold has fallen steadily since 2012. Mining companies are unable to fund new explorations. The time between gold discovery and active mining spans an average of seven years. This is a considerable time span between the exhaustion of old mines and the mining of new ones. And mining companies will find it difficult to bear the expense. Once productive and seemingly endless gold deposits are depleting quickly. Forty percent of all the gold mined throughout history has come from the Witwatersrand Basin in South Africa. During the 1970s, an excess of 1,000 metric ton of gold was mined each year. In 2017, Witwatersrand Basin’s gold production fell 83 percent compared to 1970, down to 167.1 tons. China, is still exploring veins for more gold. But how long will it be able to justify the cost as mining for gold that lays deeper in the earths crust? More capital is needed for further gold exploration globally. Until that happens, the supply of gold will remain low and the demand will rise. This means that in the near future, this could serve as a major catalyst moving forward.